During October of 2008, I had the pleasure of discovering Gogi’s Restaurant in Jacksonville, Oregon, while on a trip with my late husband Norm and dear friend Brenda Hill. It is almost ten years later and Gogi’s is still thriving. Two brothers, chef Gabriel Murphy who runs the kitchen and Jonoah Murphy who runs the front of the house including the bar, own this successful establishment that continues to please its customers. Gogi’s is located at the foot of the lovely Britt Gardens. The Murphy brothers pride themselves on using local organic products whenever possible, with much of it coming from their own one-acre farm in the Applegate Valley. I still remember the special holiday cocktail that Jonoah created for us. Even though it was for the holidays, it still is a favorite of mine for a cool March evening. The three of us took a taste and while Brenda and I were watching chef Gabriel make his special dessert, Norm finished our drinks in a flash. He said he thought we were done. Naturally, we had another. Since both brothers created recipes specifically for us, I’d like to share them with you. I have made the flan year around. Combine all ingredients in heavy bottom sauce pan and simmer over medium heat for 15-20 minutes. Remove from heat, strain and allow to cool completely. Save cinnamon sticks and orange peels for later use. Wrap orange peels around cinnamon sticks and bake in 350 degree oven for five minutes. 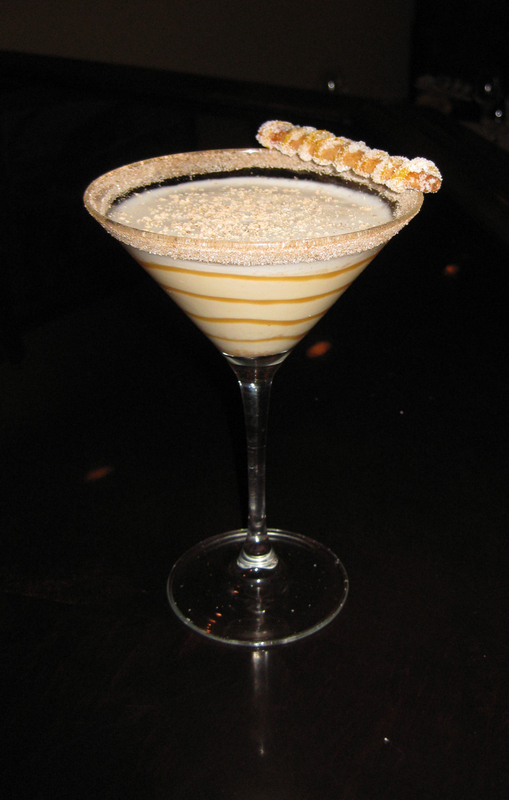 Dip a chilled martini glass rim in a cinnamon sugar mixture. Pour ingredients over ice in shaker. Shake well and strain into chilled martini glass. Place garnish on edge of glass. Method: Combine egg yolks and sugar in a bowl and whisk until color lightens. Combine remaining ingredients, except pumpkin puree, in heavy bottom saucepan and bring to a simmer. Remove the cream and spice mixture from heat and allow to cool until lukewarm. Slowly whisk the cream/spice mixture into the beaten egg yokes. Add in the pumpkin and mix thoroughly. Strain the mixture and pour into greased heatproof ramekins. Set the ramekins into a baking dish of hot water and bake at 325°F for about 45 minutes, or until set. Bring heavy cream and cloves to a simmer, remove from heat and set aside. Combine sugar and water in heavy bottomed sauce pan and heat over med-high heat until it turns golden caramel color. Reduce to low heat and stir in butter. While whisking, VERY CAREFULLY add in the cream and stir until smooth. Strain caramel and allow to cool to room temperature. Melt the butter in heavy bottomed sauce pan and add apples and spices. Cook for two to three minutes until apples begin to soften. Add remaining ingredients and reduce until apples are soft and the compote begins to thicken. Combine cream and cinnamon stick in a small, heavy bottomed saucepan and bring to a simmer over med-low heat. Combine sugar and egg yolk in bowl and whisk until color lightens. While continuing to whisk, slowly add in the cream (leave cinnamon stick in the cream). Place mixture over double boiler and whisk until it thickens to cover back of spoon. Remove cinnamon stick and chill anglaise. Combine all ingredients in mixer and beat on medium speed with paddle attachment for one minute. Place batter in refrigerator and allow to chill for at lease one hour. Using a greased, nonstick spatula spread tuile batter onto a silicon baking mat in 1×4 inch rectangles. The tuile should be no more than an eighth of an inch thick. Bake at 350°F for seven to ten minutes or until the center of the tuiles begin to color. Remove from oven and immediately drape tuiles over rolling pin or other curved surface and allow to cool. On an eight inch dessert plate, drizzle clove caramel sauce in criss-cross pattern. Invert flan into center of plate. base to hold it up. 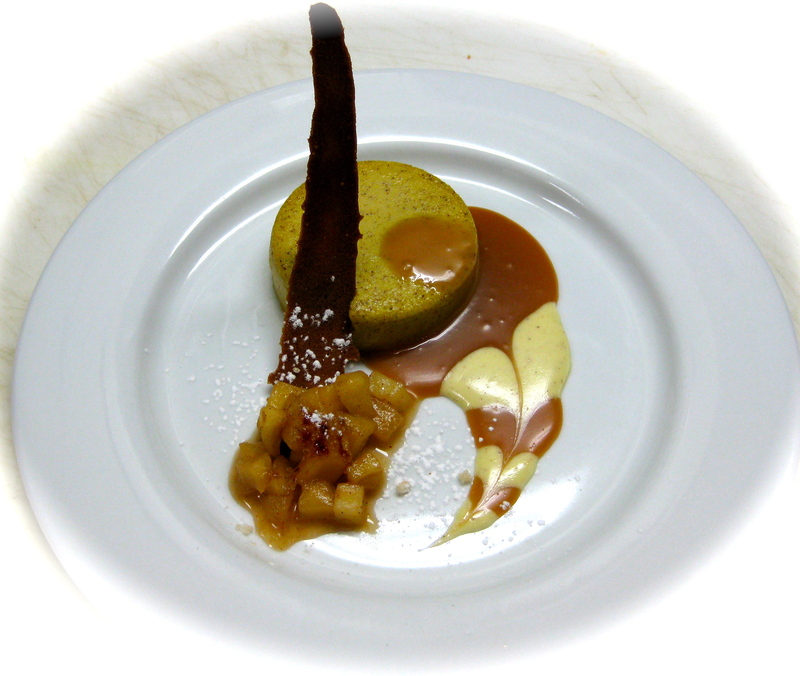 Drizzle cinnamon anglaise over entire dish (especially the compote). Be sure to check out Gogi’s if you are ever near Jacksonville, Oregon. The Murphy brothers offer exquisite international cuisine and wonderful artistic cocktails. If you don’t see a cocktail you like on the menu, talk to Jonoah and I’m sure he will come up with something that will delight your taste buds.